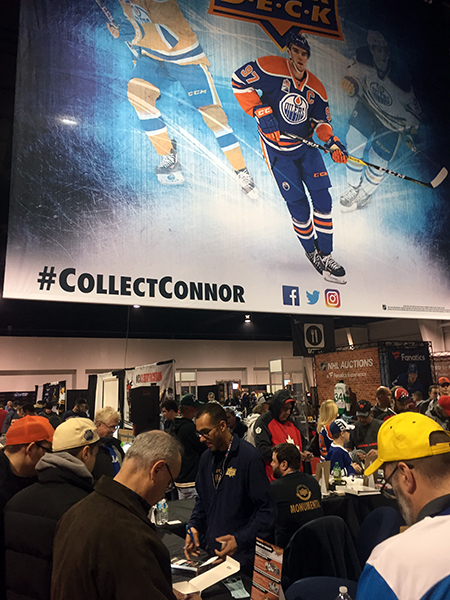 Upper Deck�s popular wrapper redemption program at the Fall Sport Card & Memorabilia Expo provided collectors with some pretty cool bonus items. The pack opening experience was awesome as fans could break with Upper Deck staff and talk about the product or they could break in comfort at the Grosnor Break Zone adjacent to the Upper Deck booth and score the same promo items. Fans love spending time with Upper Deck staff while they opened new NHL trading card products. The foil was flying at the Upper Deck booth as new NHL products were cracked open with staff. The Grosnor Break Zone was jam packed with collectors enjoying the Upper Deck pack opening experience. Collectors could stop into the Grosnor Break Zone to participate in Upper Deck wrapper redemption programs. All show long the hands of collectors were literally shaking as they pulled incredible autograph, memorabilia, relic, rookie and even printing plate cards. Watch this father who is excited beyond belief after he pulled a signed rookie card from Fleer Showcase of the 2017 Calder Trophy winner!